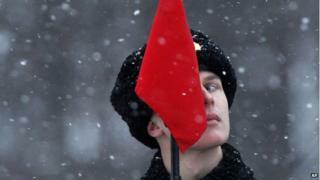 #BBCtrending: Should Russia have surrendered Leningrad? Is it ok to question how events unfolded during World War Two? That's a hot topic of discussion on social media in Russia right now. This week is the 70th anniversary of the end of the siege of Leningrad during WW2, and on Sunday the independent Russian TV station Dozhd conducted what turned out to be a very controversial poll. They asked whether Leningrad - now St Petersburg - should have been handed over to the Nazis in order to save lives. Hundreds of thousands of Russians died in Leningrad during the blockade - which lasted more than two years - but was a key turning point in the war. Asking this simple question led to a social media storm against Dozhd TV. Thousands were outraged - arguing that even posing this question was an insult to the dead. The Soviet Union's victory in World War Two remains a source of great national pride and by Monday, a hashtag which translates as "brown rain" (#коричневыйдождь) was trending - the "brown" referring to the colour of Nazi uniforms, and the "rain" to the name of the station (which translates as Rain TV). Dozhd apologised and deleted the post, but the criticism was fierce. On Twitter, they were called "idiots" with no grasp of history, and less than human. Many politicians condemned the poll, including MP Irina Yarovaya from the ruling United Russia party, who called it an attempt to "rehabilitate Nazism". The city parliament in St Petersburg on Wednesday called for a ban on the station. But others defended Dozhd. "There's nothing more frightening than a ban on analysing the past," was one of the supportive tweets. Others questioned whether the furore online was orchestrated to give the authorities an excuse to crackdown on the station - Dozhd is seen as a liberal alternative to pro-Kremlin media. But soon, angry users were targeting state media too. This happened after someone scanning the state-run Vesti news website's Facebook page found an image of Nazi propaganda minister Joseph Goebbels. It was part of a picture gallery of "great people" and their comments on Lenin. It's unclear who posted the picture or why, but Vesti promptly sacked its entire social media marketing team.